A Seattle police officer clocked a 17-year-old girl after spotting her and her friends jaywalking. 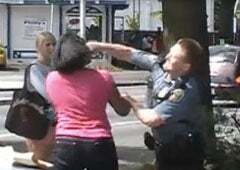 The girls were "verbally antagonistic toward the officer," things escalated...and so the punch was warranted, you know? Oh, and it was caught on video. Fun.